2 Railway Recruitment 2019-20 Updates- Latest Indian Railway Jobs Opening List. RRB Recruitment 2019 Notification: If you are looking for government sector jobs in the 2019 year then, Indian Railway is a better option to get Good salary jobs as per your qualification and region wise. Every year Indian Railway Announced thousands of vacancies in their 21 RRB’s, 17 RRC, RPF (Railway Protection Force) and various metro rail Department overall in India. In this page, we will provide you all Upcoming & latest recruitment notification detail that is published by Various Railway departments in India. So, candidates only need to visit our website on daily basis and keep your eye on the recruitment section. All the interested candidates must need to check all eligible criteria carefully before going for any further applying procedure. Most of the posts that will be published by rrb’s and rrc will conduct only Written Exam for selecting Eligible candidates and for few Group A posts it also conducts Interview, so interested contestant only need to check their desirable posts and start their preparation for the written exam. This is a great time and having milestones opportunity for applying Online upcoming railway recruitment 2019 Jobs for various Posts. As, all of we know that, Indian Railway regularly announced recruitment notification in their official websites i.e indianrailways.gov.in and in Employment newspaper for 10th, 12th, Graduates, Posts Graduation, Engineers, sports quota, Diploma, ITI and for all type of Qualification. Here, we also have good news for Jobs seeker in India, that our railway department Announced 9739 Constable, Sub Inspector RPF CEN 1, 2018 Posts, 27019 ALP, Technician Grade (CEN- 01/2018) Posts , 62907 Group D (CEN- 02/2019), 9500 RPF Bharti , 798 RPF 03/2018 and also Piyush Goyal Ministery of Railway announced they are very soon going to recruit 225,000-250,000 Vacancy in Indian railway department for Group B, C & D Posts which are expected for Safety staff, ASM, NTPC, TC Posts. For user convenience, below we provide Upcoming and Current running Indian Railway Jobs 2019-2020 Notification in Table format. So, check notification on Daily Basis. Railway Recruitment 2019-20 Updates- Latest Indian Railway Jobs Opening List. Indian Railway Board, usually announced Group Wise recruitment notification. All posts under railway department divided into Gazetted and Non-Gazetted category. Gazetted include (Group ‘A’ and ‘B’) Posts and Non- Gazetted Include (Group ‘C’ and ‘D’) Posts. Below we mentioned Group wise Posts and Education Qualification detail. Group A The posts under Group A category usually carried out by UPSC by conducting Civil Service Exam, Engineering Service Exam, and Combined Medical Service Examination. Group B The Group B posts link Section Officers Grade – upgraded posts from Group ‘C’ railway employees on deputation basis. Group C The posts under Group C category usually Include Station Master, Ticket Collector, Clerk, Commercial Apprentice, Safety staff, Traffic Apprentice, Engineering posts (Electrical, Signal & Telecommunication, Civil, Mechanical) etc. Group D The posts under Group C category inculde Track-man, Helper, Assistant Points Man, Safaiwala / Safaiwali, Gunman, Peon and various Posts in various cells and board of railway department. Railway Recruitment board have total 21, regions overall in India. RRB was founded on 27th April 1998 which is owned and control by ministry of railways, Government of India. There are 21 boards situated in different parts of India. RRB (Railway Recruitment Board) Announced Group B, Group C , Group D ,Non – Technical, Safety staff and Various Posts recruitment as per region wise. It announced recruitment notification for 10th, 12th , Graduates and any equivalent qualification posses candidates. So, Below we mentioned rrb regions wise upcoming and current running rrb recruitment 2019-20 detail in Table format. Recently, railway recruitment board conduct NTPC Written Exam for hiring 18,000+ Candidates for the Group D Posts and almost 9.2 Millions contestant filled online application form for Stage 1 exam out of which 2.7 Lakhs candidates select for stage 2 Exam and Group D NTPC Exam became world’s ‘largest’ online test to fill vacant Posts vacancies So, by this report you can easily guess the craze of Railway Jobs in India govt jobs seekers candidates. Complete selection Criteria will be filled by rrb, till the end of year 2017. In next year 2019, railway recruitment going to announced 2.77 Lakhs + Recruitment notification for ALP, Non- technical, safety staff, ASM , Drivers and various Group D Posts as per Region wise. So, interested candidates must need to visit this page, because recruitment process can be start any time. Below we mentioned rrb regions wise official websites detail. Written Exam / typing skill test Then, document verification. Jamshedpur: Railway Recruitment Board very soon going to announce 20,000 freshers candidates for filling vacant posts. As, according to source 13,000+ Vacancies will be filled for General posts and 7,000 Vacancies will be filled for Train Driver Posts in the end of 2017. So, candidates get ready for upcoming rrb 20,000 vacancies notification and ready their all documents that, is required during applying online application form. Total Number of Vacancies 20,000 Approx. According to Source, there are lakhs of vacant posts available in railway sector. 122,911 vacancies in safety staff categories and a shortage of another 174,64 loco running staff. Below we mentioned all posts that, vacant and need to be filled as soon as possible. Total Strength staff: 1.3 Millions. All the interested candidates who are looking for cells wise recruitment detail, can check below table. As, rrc responsible for hiring eligible candidates for Group C and Group D Posts under rrc jobs 2019 vacancies. All the recruitment vacancies divided into division and unit wise. Most recruitment that, RRC fill are Apprentice Posts for 10th pass qualified candidates with having ITI Certificate and Various posts recruitment against Quota that include Sports Quota, Scouts & Guides Quota and Cultural Quota. Below we mentioned current running cell wise recruitment detail and all 17, cells name with official website detail. If you passed 10th Class Exam & Want to make career in Railway department as a Govt jobs 2019 then, we have a good news for all interested candidates that, Railway Protection force decided to announced 18000 Constable Vacancy for both Male and Female candidates. For that, purpose Ministry of Indian Railway already publish news in employment newspaper and Daily news. So, candidates need to be ready for upcoming Railway constable Jobs and start doing preparation. If you interested to known more about rpf constable recruitment notification then, Please visit below link. All the interested candidates who are looking for latest Railway exams notification and doing their preparation to crack exam then, finally get selected for govt jobs. Then this section is for you, as Indian railway going to fill, lakhs of vacant posts in their respective department for that, they will conduct written exam. Indian RRB/ RRC will going to conducting NTPC, GDCE and Various exams in 2019 years. Below we mentioned tentative schedule for upcoming Railway Exams 2019. If you are looking ahead for applying Online Application and want to do online registration for upcoming Railway Exam, then you should note that, Now AADHAR CARD is mandatory document that, every Indian citizen must have to become eligible candidates for upcoming railway recruitment in 2019-2020 years. According to, Indian Railway Official announcement related to Aadhar card, they make it compulsory document that every candidates kept with them self before applying Online Application Form. If you still not applied for Aadhar card, then firstly Make it Ready. As, RRB’s already notified that, it is very soon going to start online registration to fill 2.5 Lakhs vacancy till 2019-2020 years. So, here is massive opportunities are on the way. To grab this chance, you must have to full-fill each and every eligible criteria for upcoming govt jobs in 2019 in Indian Railway Department. All the jobs seeker in India, can Now apply online application form for any given posts. You only need to follow our steps to do online registration for railway posts. Note: ADHAR CARD is compulsory for railway jobs. Take printout of submitted application Form for Future use. If you are searching for upcoming or any current recruitment notification in govt sector then, this page is for you. 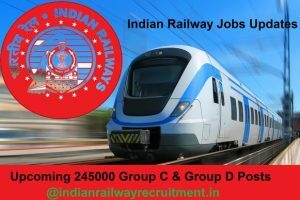 All the interested candidates who are willing to Apply Online Application form for Indian rrb jobs in 2019-20 then, “http://indianrailwayrecruitment.in” website provide you every upcoming jobs detail as per Education Qualification wise , Age limit wise, Regions wise, Sector wise and Groups wise vacancies detail with provide official notification pdf to get complete jobs notification information. So, applicant only need to visit over website on daily or weekly basis or you can just subscribe us to get direct recruitment notification in your E-mail id. If you need any information regarding railway recruitment, then feel free to ask in below comment box. we will help you and update you with latest information. Sir,in which month ntpc notification release? Sir,my name is laxmi pandit n I HV completed my10+2 and right now I am pursuing bachelor degree in hotel management 2nd year….which job will be eligible for me.I will be thankful if u suggest me. sir my name is Tularam verma and i am PG pass hu. sir kya mujhe railway me job mil sakta h.
Sir.,Iam k. Mounika and right now Iam pursing bachelor of pharmacy 1st year. Which job will be eligible for me. I will be thankful if you suggest me. I am surching for jobs I looking for 12th pass surching for government job my age 28years. You will be aply station master post in railway bro. when starting filling online application form? which date? Intend to build a career with leading concern with committed and dedicated people, which will help me to explore myself fully and realize my potential. Willing to work as a key player in challenging & creative environment. Completed 2 days training in LENOVA Company. Training period completed in Ucal Fuel Systems Limited. An enthusiastic fresher with highly motivated and leadership skills having bachelors of engineering degree in Mechanical Engineering. Always willing to innovate the new things which can improve the existing technology. Language known	:	Tamil, English. Sir,I am Monika and I am pass tradution and other course steno grafer ryping knowlage and I live in gwalior so sir l request plz give me chance your department job apply. When publish ntpc &saffety department notification. ….pls inform me..what is maximum age to fill railways requirement. and i want to work with INDIAN RAILWAYS so please can you notify me when to fill the form. I am pursuing my B.com and I am a national level classical dancer so is there any opportunity in railway recruitment.Please guide me. I am Anugya Kumari and i have done Btech from Ece branch ..I want to work with INDIAN RAILWAYS so please can you notify me when to fill the form of railway..
please notify me when form will come. My name is abhishek and my education is diploma in mechanical engineering.dob-25.10.1997. Bare m bata the rahna…..
I’m salokhe onkar suresh, I need more about Indian Railways recruitment ragardind latest vacancy. Hello sir i am Vasudevan B.E- CIVIL Engineering during final year, i am already working on part time job in civil fild, my phone no; 7639085704. QULIFICATION- MA SANASKRIT HONRS.FROM KOLKATA . age calculation 1st July ke badle 1st January hona chahiye,kyunki kuch candidates ke age 1st July lene par we eligible nahi ho payenge. Gud mrng!sir, i m ishaq i had cmplt intermediate present i m pursuing degre 1st yr so i wnt write a exm of railway .after applyng wt shuld we study plz its request to you sir . To prepare fr exm can u sugest any book . I am Kousar Ali Exservicemen.I serviced 17yrs in Indian Army force. I am finding RPF job in South Zone.my age 33 yrs.Please intimate when jobs are released. sir any govt vacancy fr me? When will be the nursing recruitment? I have also experience in electrical field. Now I am working in Parth Electrical & Engg. Pvt. Ltd. I have 10 Years experience.also I am OBC person but i haven’t criminal certificates. This is kishore kumar wanted to know about job for diploma holder. In which month there will be a online filling form for RRB as clerk? I m a general candidate.so,please the age is let be 18-35 or 20-36.then i shall take a chance to appear for the exam. My name Deepak govind chalke. I am Minati Sahu. I have completed my graduation. In which month the exams are conducted for railway recruitment 2019-2020,please updated me. I have completed my bachelor in commerce. so please update me the current railway exams. But apply kese karte h pata nhi plz help me sir I request you 😶. ..
Hii Sir… Is there any job vacancy for students. ?